We send our best wishes for the holiday season. We hope your year has been happy and healthy. 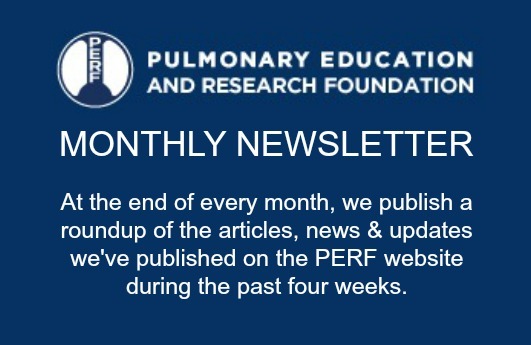 As has been our tradition, this is the time of year we update you on our work on behalf of COPD patients and ask for your support going forward. The holiday season is a good time for reflection on our successes and failures. The Pulmonary Education and Research Foundation (PERF) has been in existence for about 34 years. We’ve focused on improving the lives of those with COPD and other lung diseases and its worthwhile considering what kind of report card we’d give ourselves. I had the opportunity to consider these issues when I was invited to deliver the Thomas L. Petty Memorial Lecture at the American College of Chest Physicians meeting in October. Tom Petty died almost 10 years ago after a sterling career dedicated to advancing pulmonary medicine; he was probably the most influential pulmonary doctor of his time (perhaps of any time). Tom served as president of PERF in its earlier days and was a strong supporter of its mission. It is arguably true that Tom was the single person who did the most to introduce both pulmonary rehabilitation and long-term (home) oxygen therapy into routine medical practice. The question I posed in my lecture was: would Tom Petty be happy with our advances in these fields since his passing? In both fields, we clearly have a mixed picture. As for pulmonary rehabilitation, PERF researchers have contributed greatly to our knowledge regarding the benefits of pulmonary rehabilitation. We’ve described how muscles benefit from rehabilitation and the pathway for this benefit to translate into less shortness of breath and better ability to perform exercise. We’ve explored strategies to improve the effectiveness of pulmonary rehabilitation. I recently published a re-analysis of published data that showed that pulmonary rehabilitation was (by far) the most effective way for COPD patients to improve their exercise tolerance, reduce their shortness of breath and improve their quality of life. Today pulmonary rehabilitation is universally acknowledged as the standard of care for COPD patients who feel limited in their activities of daily living. Despite this, pulmonary rehabilitation is available to only a sliver of COPD patients who would benefit; Tom would be disappointed! Reimbursement to practitioners for this service is unsustainably low. PERF members are attempting to find pathways to improve pulmonary rehabilitation access. PERF Board member Chris Garvey is a national leader in attempts to improve pulmonary rehabilitation reimbursement. An editorial Chris (and I) authored is slated to appear in coming months in the American Journal of Respiratory and Critical Care Medicine (the world’s highest cited pulmonary journal); it suggests a strategy to improve Medicare reimbursement. We also feel that clinical research can drive public policy. We’re active in the debate as to whether promoting pulmonary rehabilitation in alternate settings (for example, in the home) will make things better or worse. Importantly, we reason that demonstrating that pulmonary rehabilitation prolongs life will lead to a wave of demand from patients and health care providers that will improve access. Designing a study to test the hypothesis that pulmonary rehabilitation prolongs life, though, is a daunting proposition. It would require over 2000 participants and take 7 years. PERF investigators, coupled with other scientists across the United States have requested funding from the National Institutes of Health for this study. Wish us luck! For long-term oxygen therapy, the situation is similar. Tom Petty led a study that almost 40 years ago showed that supplemental oxygen was an essential therapy for COPD patients with low oxygen levels. PERF investigators have participated in studies exploring the role oxygen therapy plays in improving the ability of COPD patients to be active in their lives. Dr. Brian Tiep has invented, and introduced into practice, devices that increase the utility of ambulatory oxygen supplies. Yet, funding policies in the United States have had the effect of restricting access to oxygen supplies and education in their use to patients who would benefit. A recent survey demonstrated that patients receiving oxygen therapy often have difficulties with their oxygen supplies. I wrote an editorial this year in the Annals of the American Thoracic Society positing that key questions need to be answered before oxygen policy can be adequately formulated: 1) are we giving long-term oxygen therapy to the right people? 2) do patients adhere to their oxygen prescription? and 3) do oxygen devices work as intended? We’re working on playing a part in getting oxygen patients the equipment and services they need. PERF is also working hard on its educational mission. Please visit our new, upgraded website at https://perf2ndwind.org. Have you subscribed to PERF’s blog? For over three years now we’ve been providing timely information to the COPD community. Ask your friends to sign up. Go to https://perf2ndwind.org/blog and click on the “join our mailing list” link to sign up for the blog. If you’re local to our research building in Torrance, please come and participate in our ‘PERF Better Breather’s Club’, which hosts seminars every month or so. We had some fascinating topics this year including a bronchoscopic exploration of the lungs to a live demonstration of a Mediterranean-diet recipe. These seminars are open to all and also provide an opportunity to meet with our doctors and researchers over coffee and cookies. Thanks to Harry Rossiter for keeping this program running. If you sign up for the blog you’ll receive an announcement of upcoming seminars. • Dr. William Stringer is in the process of initiating a study seeking to determine if rehabilitation in advance of elective surgery can improve outcomes. It will be an opportunity to help provide rehabilitative services to our underserved population at Harbor UCLA Medical Center. • Dr. Janos Porszasz continues to explore novel methods to analyze exercise responses. PERF-sponsored projects seek to determine early manifestations of airflow limitation. • Dr. Harry Rossiter, working with his post-doctoral fellow Dr. Asghar Abassi, is working toward understanding immunologic benefits of exercise and rehabilitative exercise training in COPD and IPF patients. • Our participation in the COPDGene study is entering its 10th year. We’ve already seen more than 50 patients of the original 760 we recruited 10 years ago. We’re seeking to determine whether there are useful sub-types of COPD that determine how patients will fare with their disease. I’ve just returned from a meeting of over 100 investigators involved in this project, a meeting full of mind-boggling science. This is a project that has spawned over 260 publications…and is just getting started. • We are often approached to assist pharmaceutical companies in testing new drugs for COPD and other lung diseases. New bronchodilators, drugs intended to improve muscle function and next-generation “biologic” therapies are all on our plate. We often help with design of the studies. Our core group of PERF founders remains active. Mary Burns and Alvin Grancell (who will celebrate his 100th birthday next May) remain strong supporters of the research in the Rehabilitation Clinical Trials Center, as well as a range of other activities, donating money through PERF to support its activities. Seed funding for research projects has yielded important results and, in a good number of cases, has attracted larger governmental grants. I’m pleased to report that Anita Gash has taken up the financial reigns of PERF. She’s agreed to assume the role of Treasurer. We give our sincere thanks for a job well done to Jean Hughes, who has served as Treasurer since PERF’s founding. This is the part of the letter where we ask for your support. This is our annual appeal for your donations: if you think PERF is a worthy cause, please consider contributing for the benefit of the COPD community here and worldwide. Our overhead is very low (<10%). I can assure you that your donation will be used efficiently to promote research and education in the fields of rehabilitation and COPD. We know how to squeeze every last cent out of your dollars! All of our Board members contribute their services; none is paid for the work they do. Your donations are fully tax deductible and will be gratefully acknowledged in writing. We hope to hear from you. We wish you and yours all the best for the holiday season and wish you a healthy and happy New Year.